It is not like you are a modest person by any means that keeps his accomplishments to himself. Sounds like a move right out of the Rossi playbook? RE: Robert Young, DISAPPOINTER OF THE CHILDREN 6/25/2016 10:37PM - in reply to Thanks for nothing. There are huge gaps, so how can the data possibly be used to confirm or deny his cheating when there is so much missing? Oops, shot yourself in the foot there. Robert Young can not be considered a cheat because of a data malfunction, to quote LetsRun.com "There are huge gaps, so how can the data possibly be used to confirm or deny his cheating when there is so much missing?". Also, we have various other forms of back up and witnesses to indicate he did not cheat. Don't we have the missing strava data? If so, can't we simply forward it to Jaime and at the very least let him know that this data was captured by LRC before Rob erased it. RE: Robert Young, DISAPPOINTER OF THE CHILDREN 6/25/2016 10:52PM - in reply to Dustin and Rob. I think that even without the analysis of your experts, the data already to hand is conclusive. How can the "data already to hand" be "conclusive" if it can't "possibly be used to confirm or deny his cheating"? Yeah, thanks Rach, looks like I'll be keeping my job now, was a bit touch and go there for a while what with the data malfunction and all. Agreed. Putting the "scrubbed" Strava data on his FB page would be great, if I wasn't blocked too. I liked Rachel's post asking how Rob ran 5:34 min/mile pace going up almost 1000ft elevation on May 20th. Rob's fans are so blind. If not blind, they're most likely new and/or slower runners who have no concept of what's possible and what's not at the elite end of the spectrum. 5:34 per mile pace is not remarkable and "up 1000ft of elevation" means nothing to them. Now if Rob had left an RV ride activity in there that was 4:00 per mile for a number of consecutive miles, up down or flat, you might have a hope of convincing them to see the light. But he hasn't. RY Facebook is loosing likes!!! This is the slow long road to a fanbase of only Turkish. He not only shot himself in the foot, he shot himself in the wrong toe. So what was the connection with all the Turkish fans? I remember seeing a graph where like 85 of the likes and views from his facebook page came from Turkey. So was he buying likes for his facebook page so it looked more popular? How can anyone believe this BS. There is overwhelming evidence that he's cheating. This is like Rossi on steroids. "how to crop activity strava"
"how to slow down activity strava"
"how to edit GPX files"
We need to make Rob Younger cheater the first page of results for everyone. Yes, we have some of the missing (original) data. But Rob, Dustin and Michael will claim that because we are trolls and haters we have manipulated that data in an attempt to prove fraud. This is even way more egregious than I thought. 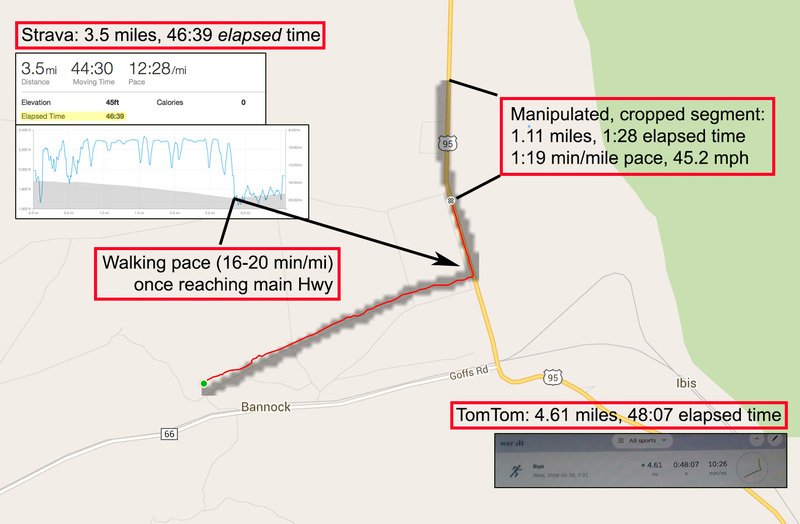 I compared a random sampling of Strava activities to TomTom screenshots, and it is abundantly clear to me that the TomTom screenshots are showing elapsed time. I had been looking details about the backtracking distance, distance across Emporia, etc., but I hadn't got around to matching it with the RV tracker data. I am in the process of matching TomTom data to tracker data. (Initial data looks like Rob might have been putting in some miles while the RV tracker was off fwiw). be mindful of the timestamps on the tomtom data. I've found some in local time and some in london time. (-5h to equal tracker time). May change depending on which watch they are using. It made some tomtom segments show up out of order on the screenshots for the section i was looking at near flagstaff. doesn't make sense. All GPS receivers will know about time zones and when the two segments are displayed side by side in the TomTom website, even if two watches logged in different time zones they should be listed in the display time zone. My two cents. Just to bump this - I've been comparing Strava vs. TomTom and yes, somehow, it appears the TomTom time zones were way off on occasion. Don't know how to explain it, but it appears to be true. Suggest these guys are involved in the independent review. They know some of the key players already. OK I explained this more here: http://ryinvestigation.blogspo...ow-up.html as a follow-up. The TomTom watches only record HR data if you turn that feature on. He would leave that off to avoid collecting the data and save battery life. What model do you have? If the activity type is Run which is what he was showing on the screenshots HR is enforced and you can't start the session without it first having locked on to it. Please specify (a) what model and year of purchase you have and (b) how you do a 'Run' activity with HR turned off - specify the menu options you use. Even better can you provide a shared public view to a Run session you did with HR turned off? On mysports, not Strava. Not at all. 75.9% of marathonmanuk facebook likes are from Turkey and 16.7% from the UK. There's a large community of new/slow runners in Turkey and they're big fans of ultramarathon running and obscure multi-day running challenges. Guy with a TomTom account who posted yesterday - does that summary dashboard display MOVING time or ELAPSED time for the activity? Thanks. There is no concept of moving time with TomTom watches/analysis software. Strava will manually calculate elapsed time if you tranfer the data. There is no concept of moving time with TomTom watches/analysis software. Strava will manually calculate **moving** time if you tranfer the data. It's at 59590...has dropped by about 50 or so since yesterday. Not many but it will do for now. Gross. His fanboys just never stop. Want to throw up reading their fawning. Let the haters hate. Do this for you and stick your fingers up at them as you pass. Except you won't because you're so bloody nice you would probably hug them if you saw them. Which is the best way to be. Most of his fanboys seem to be women. Let's hear if for the ladies! Maybe dial back the Prozac. Just as one can buy tens of thousands of FACEBOOK FRIENDS, it is just as easy to generate bogus comments of support by the bushelful, replete with the familiar poor grammar and crap syntax of the sub-literate. I wonder who that might be? Coach sKeev: Don't let the jalousie of the haters get you down Rob. We'll always have Paris. I've been doing lots of kegels and have bought a new can of schmaltz. Pamela Pink-Pudd: Rob gave me the best hug of ever in my life in the middle of the London Marethon. You inspired me to lose fifteen stone and become a Page 3 Girl. Then that evil man Rupert Murdoch went and got rid of Page 3. I now have to lose fifteen stone again. Joan Jubblies: Just like the haters hating ruined Lance Armstrongs superman achievements, they are now trying to destroy Rob. Why don't you just go and join ISIS haters? I'm assuming this is a troll post. There is no way in hell the Turkish likes are real. Not once on any of RY's Facebook posts have I seen a Turkish profile post a comment. Besides the location of the likes not being his home country, the lack of interaction is key. The other warning sign is the massively skewed distribution of like locations. A page with that many likes should not have 30,000 more likes in Turkey than the next popular country, the UK, with 10,000. The nature of the way Facebook shows posts to people means people in the UK should see the posts as well, meaning there should be more UK likes. The only legitimate way to get so many Turkish likes without also accruing UK likes would be if he specifically targeted ads to Turkey, and hid his page from the UK (this is possible in the page settings). Otherwise it would be inevitable to gain UK likes along with any other likes as the following grows.